Photograph from John Allen Chau’s Instagram account, which many suspect was from North Sentinel Island, in the Andaman and Nicobar Islands chain. His presence on the island was ILLEGAL when he posted this picture to Instagram on November 2, 2018. Whiskeytown was a small town in remote northern California’s Shasta County in the Whiskeytown National Recreation Area which was flooded in 1962 to make Whiskeytown Lake, and refers to the general area today. Perky Jerky is a brand of beef jerky, which is an evaporated animal meat/protein product. Their “ambassadors” are part-time paid help to promote the brand. 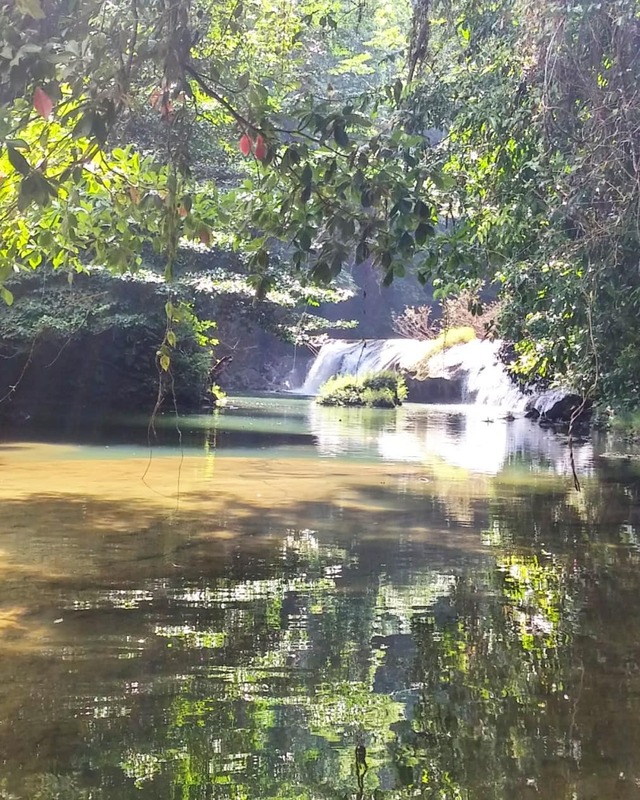 Chau maintained a mostly-inactive WordPress blog named The Rugged Trail. The “Way” is “dog-whistle” language used by some Christians to describe themselves as such, by monikering an excerpted portion of a quote by Jesus the Christ who is supposed to have said, “I am the way, the truth, and the life,” as recorded in John’s Gospel, chapter 14, verse 6. 2.) 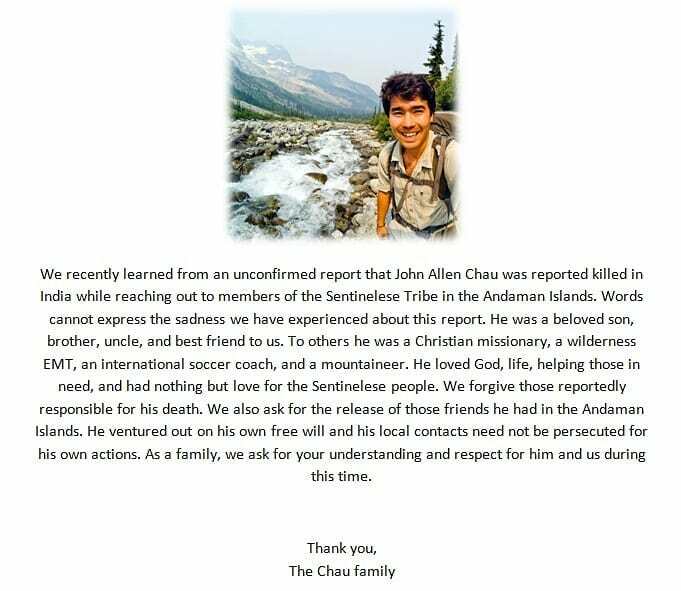 John Allen Chau was NOT affiliated with any religious organization – Christian, or not – for any missionary or evangelistic purpose, nor has any such organization claimed him, neither did he ever make any claims to being a “missionary” of any kind. Chau was a graduate of Oral Roberts University, Tulsa, Oklahoma. Image by John Allen Chau posted to Instagram November 2, 2108, believed to have been taken on North Sentinel Island, in the Andaman Nicobar Islands area. 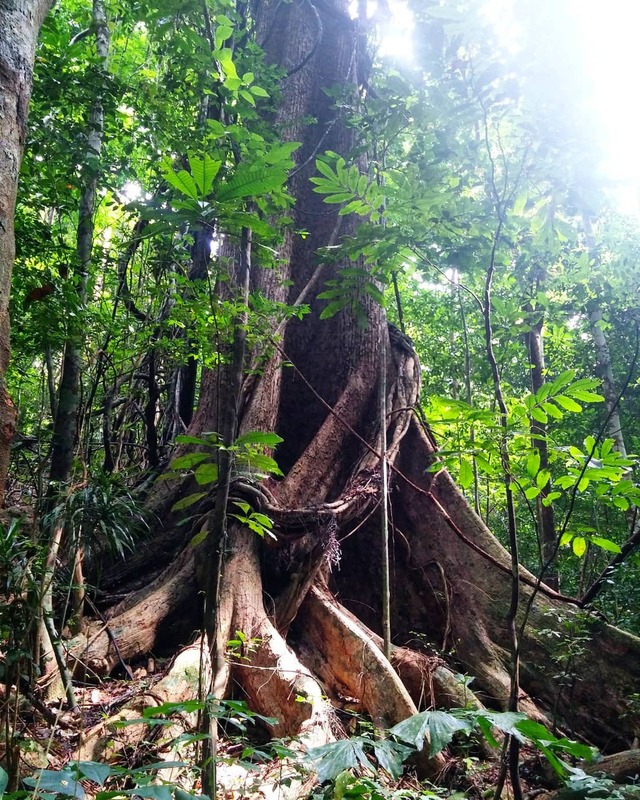 Chau may have been there at least 6 times – an illegal act – and NO ONE is legally allowed to even be in the area of North Sentinel Island, because restrictions to the region are so very strict, precisely to preserve the area. 3.) John Allen Chau knew he was violating Indian Federal Law to go near North Sentinel Island, and which also explains why he wrote things like “God, I don’t want to die” in his journal, because he KNEW the North Sentinel Islanders had a history of killing those who attempted contact with them, or trespassed on, or near their island. 5.) John Allen Chau had on other occasions previously violated Indian Federal Law which protecting the Andaman and Nicobar Islands area and people. He even posted pictures of it on his Instagram account. Based upon reports from those arrested, it’s widely believed that he was ferried to North Sentinel Island at least 6 times BEFORE his last, fateful trip. 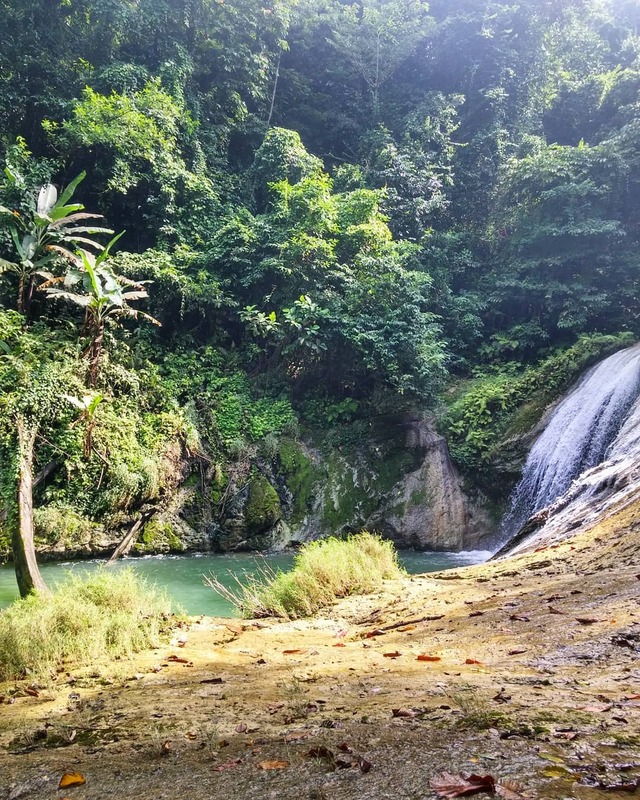 The jungle images in his Instagram account are believed to be images from North Sentinel Island. 6.) John Allen Chau said in a public interview that his first and top priority was to return to the Andaman and Nicobar Islands area. 7.) John Allen Chau conspired and colluded with others to hide himself from authorities while illegally visiting North Sentinel Island in the Andaman and Nicobar Islands area. 8.) John Allen Chau had recently moved with his mother from Mobile, Alabama to Vancouver, WA. Image posted by John Allen Chau November 2, 2018, believed to be in North Sentinel Island, in the Andaman and Nicobar Islands chain. He was very likely there – which is illegal – at least 6 times. There are SIGNIFICANT restrictions for visitors to the entire Andaman Nicobar Islands area. 9.) John Allen Chau was ignorant, and acted illogically, and nonsensically, if not selfishly stupid. He has said/written that he wanted to translate the Bible into their language. But, NO CIVILIZED HUMAN BEING ON EARTH HAS EVER KNOWN THE LANGUAGE OF THE SENTINEL ISLANDERS. • North Sentinel Islanders are LITERALLY Stone Age primitives, who DO NOT have a written language, neither can they read. • It’s highly doubtful and questionable if they even know how to make fire. • DO NOT even have a rudimentary form of the wheel. • DO NOT use any form of money. • Likely eat all foods raw. • DO NOT know how to make bricks. • DO NOT have domesticated animals, nor attempted domestication. 10.) 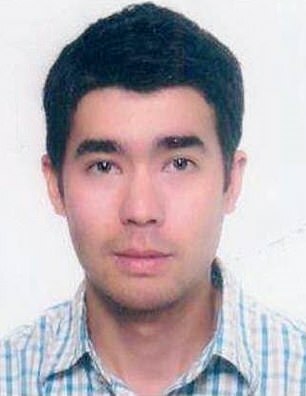 John Allen Chau in his earlier visits to the Andaman and Nicobar Islands stayed in a “safe house” in the Port Blair area (capitol city of the Andaman and Nicobar Islands chain) to avoid detection by Indian Law Enforcement Authorities. 11.) John Allen Chau DELIBERATELY hid from Indian Law Enforcement Authorities because he KNEW what he doing was a CRIMINAL ACT. Andaman Director General of Police, Dependra Pathak, said “He lived in Alabama” of John Allen Chau. 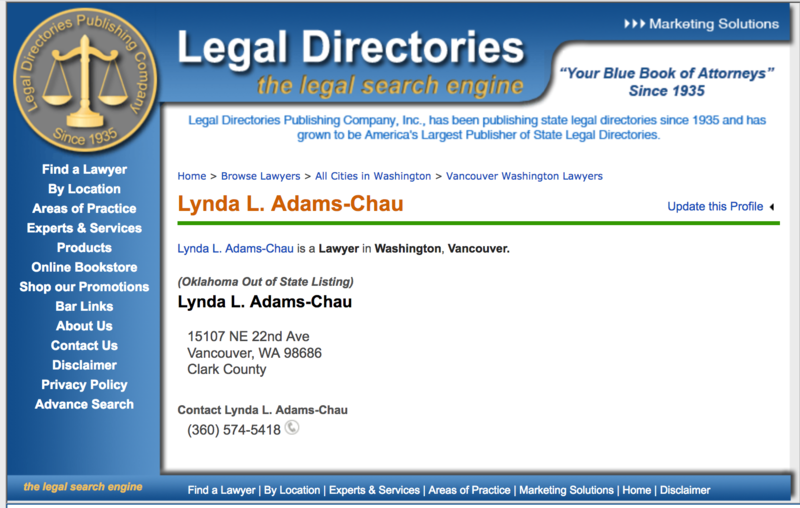 Lynda Adams-Chau is John Allen Chau’s mother. This is a partial result of a quick search for her name on the Internet. Andaman Director General of Police, Dependra Pathak, said “He lived in Alabama” of John Allen Chau. 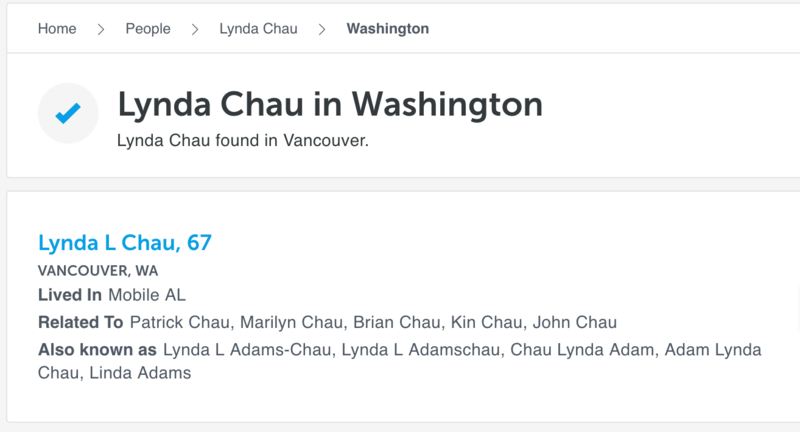 Lynda Adams-Chau is John Allen Chau’s mother. This is a partial result of a quick search for her name on the Internet, which shows that she lived in Mobile, AL. 13.) John Allen Chau is dead, and was nothing but a thrill-seeking criminal who thought it’d be the greatest feather in his cap of all times if he made contact with the North Sentinel Islanders, and abused the name of Jesus to justify what he did. He may have introduced infective organisms to the island and the people, against which they have no natural immune defenses, in which a mere cold could imperil their lives. If anything, if the North Sentinel Islanders die, or become extinct in the next year, or so, we can probably thank John Allen Chau for killing them. Their wanna-be savior killing them, and abusing religion to justify his self-seeking actions. This entry was posted on Monday, November 26, 2018 at 8:42 PM	and is filed under - Did they REALLY say that?, - Lost In Space: TOTALLY Discombobulated, End Of The Road, WTF. 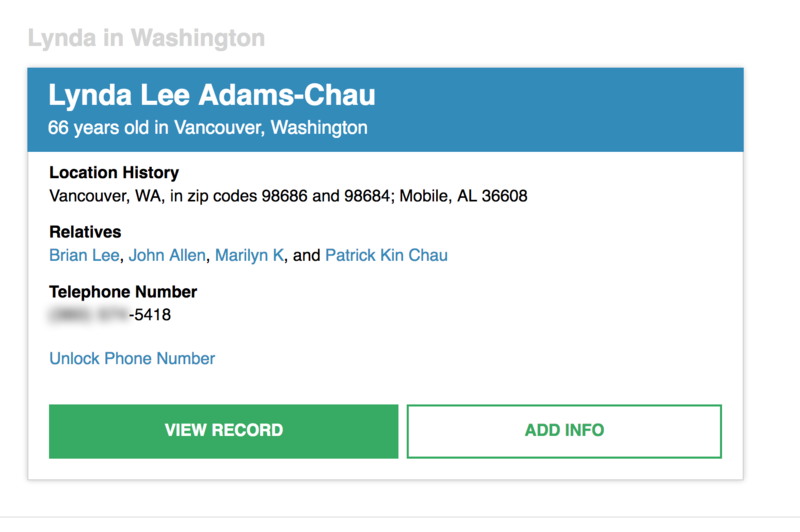 Tagged: Alabama, Andaman, death, India, islands, John Allen Chau, Lynda Adams Chau, Mobile, Nicobar, North Sentinel Island, Sentinel Island, Stone Age, Vancouver, Washington. You can follow any responses to this entry through the RSS 2.0 feed. You can leave a response, or trackback from your own site.